The Silver Cross has been a pioneer in the stroller industry creating the FIRST baby carriage ever! They’ve been making strollers since 1877. This company has been very popular in Europe for a long time and they are finally entering US market. I am not sure why it took them that long. Their latest model Silver Cross Wave combines timeless style with modern-day functionality adapting to the changing needs of the modern families. The Silver Cross Wave is a reversible seat stroller that can be converted from single mode into a double mode and can handle twins or siblings close in age. It comes with all the adapters needed so you can use it as a double stroller right away. This stylish looking buggy is very similar to the beloved UPPAbaby Vista model that also converts from single to double. It also comes with a bassinet and features: roomy seat with one-hand recline, large canopy with pop-out sunvisor, large basket, flip-flop-friendly brake, adjustable handle bar and leg rest and etc. The cool thing about Wave is that you can use built-in adapters to position the main seat higher on the frame bringing your child closer to you and promoting better bonding experience. The Wave is made out of high quality materials and fabrics that give it high end look and feel. I do think that Vista looks a little simpler and more practical than Wave model. While I think Wave is one of the most stylish models on today’s market, one of the things that bothers me is the super heavy weight of 36 lbs (in single mode with seat attached)!!! I would have to remove the seat from the frame every time I need to load it into the trunk because I have a bad back and there is no way I will be able to throw this buggy in. For comparison Vista weighs only 26 lbs. This luxury also comes at a luxury price of $1,299 with bunch of included accessories like bassinet, bumper bar, bassinet mosquito net, mosquito net, rain cover, bassinet rain cover, cup holder, seat liner, car seat adapters, and second seat adapters. And, this is not including a car seat … I know, it’s a LOT! -Great canopy. It has a great canopy with two large panels and two pop-out sunvisors that will provide your child with full coverage. There is a plastic peekaboo window with magnetic closure that doesn’t let the air in, but there is also a hidden mesh window that can be exposed for better ventilation. -Telescoping handle bar. The telescoping handle bar goes from 36″ up to 42″ from the ground giving parents 6″ range. Perfect for shorter and especially taller parents who might need more leg room. The handle bar is covered with real premium leather that you can also see on the bumper bar. -Reversible seat. The seat is 13″ wide with 18″ seat back and a measurement of 22″ from the bottom of the seat to the top of the canopy. This is an average seat size. Most of the reversible strollers have the same dimensions. The main seat has one-hand lever recline with three positions. It does keep that ‘v’ shape when reclined so your child will be always in the sitting position (not my favorite but very popular). Just like with most reversible seat strollers, to reverse the seat all you need is push a button on both sides, swing it around and click it back in. Easy! -Double mode option. You can turn your stroller into a double mode by adding a second seat or bassinet or car seat. The main seat has weight capacity of 55 lbs while the second seat can handle up to 45 lbs. The stroller can take two seats, two car seats or two bassinets. With 16 different combinations it can easily accommodate twins or siblings close in age. All the seat materials are removable and washable. Now, I want to say a few words about seat combinations. Not all of them will be comfortable for your children. Because Wave doesn’t have a very long frame, your kids might feel cramped. In some positions the recline might not work because there is just not enough room. You will probably pick your favorite and will stick with it. Just FYI. -Double mode adapters. INCLUDED! You can turn your stroller into a double tandem stroller with included adapters. Now, the cool thing about those built-in adapters is that you can use them without the second seat to position the seat higher on the frame. Bringing your baby closer to you promotes better parent-child bonding. This is one of the biggest features on strollers like Stokke Xplory where the seat is higher on the frame. Many parents would buy unpractical Xplory just because of that. I love this option. -Bumper bar. INCLUDED! The swing-away removable bumper bar is covered with real premium leather. You can see nice hand stitching and embossed logo. -5-point harness. It has an adjustable padded 5-point harness with center release buckle. -Adjustable leg rest. The leg rest is adjustable and has multiple positions. The leg drop measures at 9″. -Large basket. The basket is not as large as on Vista, but it has a hard bottom and can fit up to 33 lbs!!! This is one of the highest weight limits I’ve seen. Your largest diaper bag will fit with no problems (plus bunch of other baby crap). It’s 19″ x 17″ and 8″ deep. There is a small pocket inside for small essentials. -Flip-flop-friendly brake. There is a one-step flip-flop-friendly break with green and red indicators that locks both rear wheels in place. -Large all-terrain wheels. It rolls on foam-filled tires with 11″ tire in the back and 7.5″ in the front. The front wheels are swivel, but can be locked straight. These are a good size wheels that can handle any terrain. -All-wheel suspension. Makes the ride much smoother absorbing all the bumps. -Easy fold. The fold is easy, but not one-hand. The fold is very similar to UPPAbaby Vista model and is just as bulky. Of course you can make it more compact by removing the seat and rear wheels. The folded dimension are 15.5″H x 24″W x 38″L. There is an automatic lock, but no standing fold. Now, on their site it says the weight is 33 lbs with the seat attached, but in real life with the bumper bar, canopy, and basket it’s more like 36 lbs!!!! This is one of the heaviest strollers on the market. -Car seat adapters. INLCUDED! 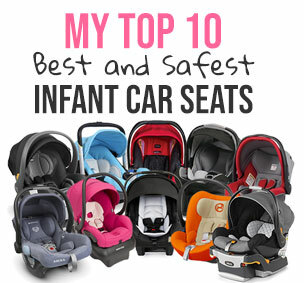 It works with major car seats like Maxi-Cosi Mico AP, Mico 30, Mico Max 30, Cybex Aton, Aton 2, Aton Q, and Nuna Pipa. -Bassinet. INCLUDED! The bassinet can be used from birth and up to 20 lbs. All adapters are included so you can start using the bassinet by itself or in a double mode with the main seat. It’s approved for overnight sleeping so you baby will have an extra sleeping place at home or when you are traveling. It comes with a warm apron with magnetic closures. It features large SPF 50+ sunshade that also has two pop-out sunvisors that will provide your child with plenty of shade. The mesh section in the middle (with magnetic closure) can be open to let much needed breeze on a hot summer day. The bottom of the bassinet has is a great ventilation system that can be open or closed. The bamboo fabric lining has natural anti-bacterial qualities, is hypoallergenic, and helps regulate temperature. I am absolutely in love with this bassinet! -Stroller board option. You can purchase a stroller board so your older child can join the ride. -Bulky. Like most convertible strollers Wave is bulky when folded. -Very heavy. In single mode with the seat attached it weighs 36 lbs!!! Can you believe it? For comparison, Vista weighs only 26 lbs. BTW, on Silver Cross site it says the weight is 33 lbs, but it’s not accurate. -High price. This luxury stroller is not cheap however it does come with a lot of accessories and can be used in a double tandem mode right away. These two strollers look very similar and have a lot of similar features like great large canopies, roomy seats, telescoping handle bars, adjustable leg rests, swing-away bumper bars, reversible seats, deep one-hand reclines, flip-flop-friendly brakes. While you do get less accessories included with Vista, it’s 10 lbs lighter, has larger basket, lower price and a standing fold. With Vista you will need to purchase additional adapters to convert it into a double mode. Silver Cross offers a limited 3 year warranty on the stroller. Here is more information on the warranty. The Silver Cross Wave is available in five colors: granite, sable, claret, midnight blue, and linen. This baby comes in five colors and retails for around $1,299. It comes with a bunch of accessories: bassinet, bumper bar, bassinet mosquito net, mosquito net, rain cover, bassinet rain cover, cup holder, seat liner, car seat adapters, and second seat adapters. Hello Susan! I bought the Silver Cross Wave after having a second baby. It’s a beautiful stroller, but I didn’t realize that there is no snack tray or cup holder option available for the children. Seemed like something that all stroller brands offer, but apparently not. Quite inconvenient since a lot of snacking tends to happen on the go. Do you know if there is a different accessory brand that is compatible with this stroller? The soft structured snack trays/cup holders that attach on the belly bar seem subpar, at least according to other reviewers. Thank you!! hi, the review says you can buy a stroller board to attach but i cant find anywhere one that states you can? please can you confirm where this can be bougjt and the make?